"In poetry, we try to say what cannot be said. We are after things that speak to us on a much deeper level. That represent something so innate,we know it but we can't really say what it means. We know it when we see it." Clarence Major is well and widely-known as a poet, novelist, essayist, editor and teacher. His first novel, All Night Visitors, came out in 1969; a year later, his first poetry collection, Swallow the Lake, won the National Council on the Arts Award. Major continues to publish steadily in both these genres. He is also the editor of two poetry anthologies, a collection of short stories and two volumes of African-American Slang. Configurations, New Selected Poems, 1958-98, was a 1999 National Book Award finalist. He recently completed both Inez, a memoir of his mother, and a book of essays, Necessary Distance. A long-time teacher of poetry and creative writing, he has been on the full-time faculty of the University of California at Davis since 1989. 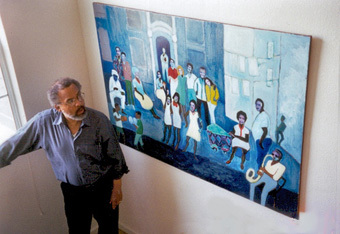 Less well-known is that, for more than 40 years, Clarence Major has also been a serious painter. The first entry on the creative chronology I made in preparing for this interview was: 1950 Oil painting entry in exhibition, Carnegie Institute, Pittsburgh. At the time of that exhibition, Major was 14 years old. He has been both a working, exhibiting artist and a working, publishing writer for most of his adult life. A collection of essays on his work, Clarence Major and His Art: Portraits of An African-American Post-Modernist, edited by Bernard Bell, is due out from the University of North Carolina Press in January 2001. On August 1, 2000, I drove to Davis where, after a tour of Clarence Major's art-filled and artful house, we had a wonderful two-hour conversation. What follows is some of what we said. Mary Zeppa: Most of your life you've been both painting and writing. I've read about some of the things that contributed to your early awareness of the power and beauty of language: the poetry of the Bible, your Mom reading to you and your sisters, the books in your personal library that you read over and over again. But I don't remember reading anything about your early visual experience. That hasn't gotten as much attention as the writing and it's something that I've done from the very beginning. The painting started before the writing. I won a scholarship, very early, to the Art Institute of Chicago and continued on there over a number of years. And also took private art lessons during that time and later. Now, some attention is beginning to be focused on the paintings--a book is coming out that has a good representation of the paintings over a 30 year period. How I learned to see? I can't say where that impulse comes from but it was there. I had the need to try to represent what I saw and what I felt about what I saw, which is more important, as early on as I can remember. This was before school. Had to be nursery school. And one of the big influences, early on-- in the '50s when I was in my mid-teens--was seeing a show of van Gogh's paintings at the Art Institute of Chicago. It was a huge, landmark exhibition. The biggest that had ever been outside of Europe. I went every day. And was just mesmerized by the intensity, the power, the colors, the attention to people in all kinds of moods, poor people, peasants. I'd never seen anything like that before in my life. It was absolutely mesmerizing and moving to see in sequence, room after room after room, the vision of a single person. I was very deeply touched by it all. That's right, that's right. For high school kids. So you had already started when you saw this exhibition. Right, right. One of the nice things that came out of that experience was that my stepfather bought me a very, very expensive exhibition catalogue which cost an enormous amount-- for us. My parents owned their own business but we were not rich. We couldn't afford, very often, things like that. It was very touching. One of the nicest things he ever did. I didn't have a good relationship with him, generally. So it's especially nice that you have such an important thing to remember. Van Gogh was one of the most literate painters in modern times. Most painters didn't read. Van Gogh read a book every night. He'd finish a painting and he'd go home and read a book. He was a reader. Very literate and interested in literature. My friend characterized visual art, for her, as "visceral and psychic and feeling." I thought that connected pretty directly to what you said in the interview with Elisabeth Sherwin about Configurations. You said it again, today: I try to paint what I feel about what I see rather than what I see. That's true but more and more, I find myself consciously aware of what I'm really doing. For years and years and years, I did paintings without a lot of conscious thought about what I was after. I'm sure I was after something very interesting all the time but I didn't think about it. In retrospect, I can see that I've always been trying to solve problems of composition. Looking at compositional possibilities and trying to see what kinds of solutions I could come up with that would be most interesting and dramatic. Drama is a term van Gogh used a lot: how to find the most dramatic representation of a composition. There are only a few kinds of constructs that are interesting: triangles, squares, rectangles, circles. We don't have a lot. You can look at almost any great painting and find those kinds of constructs, those dramatic interactions between forms within a composition. Such as a circle adjacent to, say, a triangle. Almost any good painting could be abstracted to those kinds of levels. The other thing I've become more and more conscious of is that for years and years I was working with what the Impressionists had taught me: that you had two primary things, light and shadow. That was how you illuminated things, that was how you created form: light and shadow, light and shadow, light and shadow. But, over time, I came to realize that what I was most interested in, and this is something that has grown recently, over the last seven or eight years, is how a thing is illuminated from within itself. I've found that the hardest kind of painting to do is to find the terms on which an objectcan come to life without that process of light and shadow: with its own illuminosity, with its own inner integrity that gives it a position within a composition. It's very difficult. I was trained to create objects in terms of contrast. And of course color. What I learned from Cezanne was that you could do it with color, layers and layers of color, warm colors and cooler colors, warmer colors in the foreground, cooler colors in the background. But that was not the same thing as finding the terms on which an object can come to life on its own. Before I began reading Configurations (New and Selected Poems, 1958-1998), I looked up the word "configuration" in the American Heritage Dictionary of the English Language. It has a number of meanings: the arrangement of the parts or elements of something, the form of a figure as determined by the arrangement of its parts. And then, in psychology, of course,it's a gestalt. Now the cover art for that book is your painting with the same title. So I'm wondering whether that painting, either the images themselves or the title, had any impact on the choices you made when you were putting the book together. Yes. Absolutely. The word, I thought, really represented what I was trying to do with poetry. It also represents pretty well what I'm trying to do with the paintings. With both, in some ways, I'm looking forways to create an interesting composition. Poetry, whatever else it's about, is always about itself. It may be about anything but it's always, always about itself. Unlike prose, it's a very intense investigation of its own process and, in that sense, it's always been very self-conscious, self apparent. You're painting with the materials-- canvas and paints, to be literal-- but also with colors and shapes. And there's a sort of parallel for a writer: you've got your pen and paper or your keyboard. But it seems to me that the words are both more fixed (because there's a definite spelling, number of letters, and so forth) and slipperier because the meanings, especially in conjunction, can spill out from here to eternity. And, at first, I was thinking that colors and shapes are more elastic because the meanings are implied rather than stated. But the nuances are still there, they still open out after your initial reaction to the primaryimage or definition. So you're still working with the implications of "blue" whether it's four letters on a page or a hue on a canvas. That'sa very interesting dilemma. The way I see it is, painting is visual.Actually, both are visual. I mean words are little things on paper. Writing is little scratches on paper and of course, painting and drawing also take place on a two-dimensional surface. Writing is primarily temporal, takes place in time. And painting is primarily spatial, takes place in space. These are the two things we have that we can never define: time and space. They may be the same thing, for all we know. But the points you made about the similarities are also real which is what makes it so difficult to talk about. The word "blue" is not the color. The word "blue" is possibly much more about its own linguistic history than it is about the color that it represents. In any language. It my have more to do with its own etymology. That's one of the problems with representation in writing. A writer creates a series of illusions through artificial means; a painter creates a sequence of illusions through artificial means. The results are different. The processes, in some ways, are similar. Now, when I say artificial means, I come back to the relative ability of words ot represent what we call reality of experience. There are limitations on what words can represent. "Couch" is not really this thing I'm sitting on. It's a word. Contemporary art has gone through an enormous sequence of changes over the last 50 years. Artists are trying to put mud on canvas, real hair. Trying to deal with just the question of representation. Rather than painting a shirt, take a shirt and glue it on the canvas. The issue is always there. AndI went back, with a great deal of relief to representation. But slowly,through a series of more expressionistic kinds of things. I thinkI've been back for the last 10 years. I can, I can. But I don't (chuckle) jump up from the computer and run over and paint a little bit. Although, I've done that. They feed each other, though, don't they? I was fascinated to read about (the painting) "Country Boogie" coming outof the novel Dirty Bird Blues. A kind of overspilling, a need to express something in a different way. Is that a common experience for you? Sure! That happens often. Actually, I find myself writing poems about things I can't paint and I paint things that I can't write about. Sure, sure, sure, yeah. False starts. And it's nice to have another medium to go to. Do you think of yourself as a painter who writes or a writer who paints? Or do you feel those things are equal for you in both your passion and your skill? Well, obviously, I'm better known as a poet, a writer, but what I feel is...How can I put this? There is no hierarchy of commitment. Both are so subjective as experiences. I've never thought about ranking them. That's the word I want. I've never ranked what I love and what I do and the kinds of accesses to expression. They're just different means of expression for me. I don't think anyone has ever asked me that question before. It's a very good question. It makes me think about it and I can honestly say I've never ranked them. I'm certainly aware of the fact that I'm not as well known as a painter. And, in all honesty, I'd have to say that may affect my self-perception. Make me a little less secure as a painter. Although I think my sense of security as a painter has been growing. My poet/painter friend tells me she thinks painting is more fun. Do you feel that way too? It used to be agony for me at times because of the problem solving. But I've gotten better so it's more fun than it used to be. I set certain problems for myself and they were harder to solve 20 years ago than they are now. And I think more about what I'm doing. Ahead of time. Also, I know more about technique and I know more about materials. And how to control them which was a source of my agony 20, 30 years ago. (laughter) What do I do with this? It's not acting right. It's the same with writing a poem. There are agonies in writing apoem. And then there's great satisfaction when you get it right. You've talked a lot in interviews about process. How, for you, the pleasure's in the process. So, so you ever have one of those poems that's just (snaps fingers) there? Yes, yes. That's a great pleasure. That's a gift. Everything falls into place just beautifully. But sometimes, with poetry, I have to see the shape of it on the page. Over and over and over, before I find the poem that's in there somewhere, somehow, trying to emerge. I do a lot of drafts. How do you feel about the difference between the way a poem is on the page and the way it might be at a reading? The trade-off between someone alone, silently reading one of your poems, able to take her time and think about it in diferent ways, or that same someone hearing you read it, hearing the rhythms and the intonations as you intended them? Most of my poetry lends itself to the voice and is meant for the ear. I hate to think of the page as solely a blueprint. I think a lot of visually interesting things are going on on the page. But reading the poem to an audience is a different experience. Poetry is a verbal art. It's music made with words. And those words have a certain shape and relationship to each other. A certain kind of cadence and a certain kind of sequence, the rising and falling of the voice, the line. I teach poetry. I teach a very large class (about 125) called "Close Reading of Poetry." I try to get the students to understand these issues and to enjoy the poetry first, because if you go at 'em right away with "you gotta learn all these technical terms," you lose 99% of the class. I've had some successes, I think, with students because I take just the opposite approach. I think the difference is that a person who writes poetry understands poetry in a different way than an academic, a scholar. How does teaching interact with your work? Do you find that it feeds your work,too? Yes, yes. I learn. I'm not happy with teaching unless I'm learning. I like to learn and I like to learn through the process of teaching. I try to teach things that I want to know more about. If I'm teachingfive or six books, they're usually books that I've recently read and want to understand on a deeper level. ...and with the poetry, too. If I teach the same poems over and over, I'm understanding them on a deeper level all the time. I've taught Elizabeth Bishop for 10 years now and every time I discover something new and different in the poems. Because they're so complex and rich. And I find myself saying things that I've never said before about the same poems so that each group of students hears something different. Teaching is a great balance to the loneliness of writing, the isolation. To write, you have to be alone. You with the blank sheet of paper. Can you write and paint during the school year? Not as much as I'd like. No. Because I'm usually (chuckle) grading papers. It consumes me. But I try to keep the summers free so that I can catch up. When I was preparing for this interview, I made up a creative chronology. And I am amazed by how prolific you are in all the different media. When you were in your teens and twenties, your focus was on painting. And then, in 1969, your first novel, All Night Visitors; the next year, your first book of poems, Swallow the Lake. And almost every year since then, you've had a book of poems or a novel or a collection of other people's work that you've edited come out. Some of those years, you've also had exhibitions of your paintings or some of your visual art has been reproduced in books or anthologies. And we're not even talking about the two volumes of African-American slang that you edited. So, now obviously, you must be a very high-energy person. But it's still quite an astonishingly high output! Everyone says that. And I guess it's true, but you have to realize that I've been writing and painting for a long time, 30 years or more. But you know it feels to me like I don't have enough time. I don't write every day like most writers. I wish I could but I don't. Yo umust have, then, periods of time when a great flood of things comes out. Right, right. I do write very intensely when I'm working on a book.I try to work every day. And I try not to start a long book duringthe school year because I get too frustrated not being able to work on it.I've had to put manuscripts aside for a whole academic year. Andit's agony, it's frustration. I wake up with ideas and I have tojot 'em down, put 'em in a folder and then I have to go on and do somethingelse. And I can't do anything about it. That'show I wrote Inez. It just happened to start during the teaching, the academic year. And I had to put that aside for a whole academic year. All I could do was just scribble a few notes and throw them into a folder. And then, one summer, I just poured myself into it. And then, I had to put it aside again for another whole academic year. That's how it got done. Getting a final draft took several years. Hopefully, it will be out either late next year or early 2002. And will she be around to read it? Her mind is absolutely superb. She'll be 82 this year and she's sharp as a whip. Memory better than mine. Her recall ability is just like (snaps fingers ) that. And not just with things years and years ago like most people up in their 80s. Good genes to come from. I look forward to reading it. I recently finished your novel Painted Turtle: Woman with Guitar anda couple of things intrigued me. One was the likely connection with your collection of poems, Some Observations of a Stranger at Zuni.That seemed like an overspilling of one medium to another. Am I right about that? They came out of the same time and place. The poems in Some Observationswere written at the very same time that the novel was written: side by side. There were things I felt I needed to say about that culture that felt better in poetry, in verse form. So I found myself with two different typewriters in a sense. I was working, interestingly enough, on a manual typerwriter on that book. And I have this feeling that the kind of materials you use actually has a subtle relationship to the final product. I can at least feel a kind of difference in the pacing. It's the way the keys on a manual typewriter kind of clang and the feeling of the lines in the poems and the shape of each sentence in the novel. But also, the novel was meant to be very lyrical. So it's not all that far in spirit from poetry because that's the kind of novel I was writing. I try for a lyrical quality in all my novels. Lyricism of one typeor another. Dirty Bird Blues certainly draws on the blues tradition. Yeah, that's literally what I did. Listen to blues records. Not when I was doing the first draft but when I was working on the revisions. During the revisions, I listened to blues constantly. Kind of in the background, so it sort of fed the spirit of the book. To go back to Painted Turtle for a moment: maybe it's because I'm a singer too, but I wanted the music for her songs so badly. Did you imagine the music for those songs? Well, they don't really look like real songs on the page. They're more like poems than songs. ...in the culture. Yeah, they do. In terms of subject matter, they were very carefully selected to represent certain aspects of Zuni culture, certain concerns and obsessions of Zuni culture that keep recurring throughout the history of the people, and their mythology and their social life. So, I called them songs, but they are really poems in a sense. You have real songs in Dirty Bird Blues. Songs that could be put to music because they follow the blues pattern, because it's about a blues singer and I wrote the songs for him. Yousaid in one of your interviews that you like to try new things and that the most challenging thing about writing fiction is selecting the right voice and developing and understanding that voice. You also assume personas in a few of the poems in Configurations--in the long poem The Slave Trade and in the Zuni poems, as well. Was this because both of these were so far out of your direct experience? I tend to write poetry in the first person. That was my observation and that's why I noticed the difference. But you know it's a different experience from writing fiction. Can you talk about that at all? Say how it's different? It's really hard. In poetry, we try to say what cannot be said.We are after things that speak to us on a much deeper level. That represent something so innate, we know it but we can't really say what it means. We know it when we see it. And that's never been the objective of fiction. Fiction has always had more of a relationship with history. By that I mean: it represents, through the device of historical consensus, the truth of collective human experience. People go to Dickens, say, because he gives us a picture that validates that consensus. Poetry is about this other inexpressible thing. I know you've spent long, productive stretches of time in Europe. In Paris and in Nice and that incredibly productive year in Venice. You talked in the 1996 New York Times article about the artistic nourishment and the energy that Paris gave you. How satisfying it was to live there with the streets named after artists and writers-- your kind of city. But you came back! And I'm wondering whether language was a part of that. Language, yes, yes. And it's only one of the elements that pose a problem. There's also finding a means to live abroad, to sustain one's self. We've made peace with spending long periods of time in countries we like. We love Italy. The other thing I, as a person, as a human being, have come to realize is that I'm not completely at home, there or anywhere. I've made peace with that. And I see it now as an advantage, as a positive thing because it gives me a kind of really intense, conscious edge on my experience and my participation in any circumstance or community in which I find myself. See, I came from a broken family and my sense of home was interrupted very early. There are social issues, too-- race is part of it-- there are all kinds of things we could talk about. But just on a personal level, I come from a place that I think gave me a toughness about community or a sense of... not belonging. And I felt that early, very early. Isaw it as a disadvantage for many, many years and I worried about it.It was one of the things that drove me to other countries. And inEurope, my identity was clear to me for the first time: I was profoundlyan American. But I didn't know that since I hadn't felt all that comfortable as an American in my own country. I want to emphasize that not all of that was social. A lot of it came out of my own personal roots, out of that sense of dislocation early in life. Coupled with the social problems of racism and so on. I began to see that the sense of dislocation became an advantage: therewere certain avenues to objectivity that I would not have had otherwise. And I was able to make a certain kind of peace with dislocation, with being an outsider. I feel a little bit of that myself. And it also ties into an idea that I've had for a long time: that our weaknesses are our strengths.If we know what to do with them. Right. Right! Exactly! You said it very well. That's it. Thank you. (laughter) I've thought about it a lot. And I think it is an advantage for us if we know what to do with it. That it's something you could use. What do you think is the purpose of writing? Why do we do it? What's it for? I was preparing to interview another poet years ago and this phrase came full blown into my head: "Literature is enriching and life-enhancing like any other natural resource. Like the Rockies or the Redwoods. It's the human voice." And her response was: "It adds energy to the universe." I like that answer. But I would be a little less spiritual and say that it adds another cornerstone to civilization, to culture, that helps to make us more humane and more human and, hopefully, more civil. And it gives us a greater intellectual, artistic, and aesthetic sense of who we are as the human race. That's a very secular response butI think it's valid. It intensifies what we already call our cultureand civilization. Builds on, I guess is a better way to put it. Well, it does both, I think. It's a lens. A lens. Right. I think that's a very good way of saying it. Now, what personal satisfaction could one get out of that? Well, I think it's an interesting way to participate in one's community, in the life of one's culture. And to be a productive member of society. And, for people like you and me, it's pretty important. And I don't mean just in terms of our own work. But in terms of what's already been produced, to which we have access. I always remember something Einstein said in an interview. Someone asked, "well, how do you account for all the great things you've done?" And he said, "what little I've accomplished was because I was standing on the shoulders of giants." But that's all any of us are doing.We have a history, a cultural history, that we are working out of and sometimes against. At best, what we do is to add a little bit to that history before we go on. MaryZeppa, four of whose poems appeared in Volume II, Issue 1, is also a literary journalist. Her interview with Clarence Major is the latest in aseries (including Robert Hass, William Stafford, Sam Hamill, Diane DiPrima, Charles Wright, Sandra McPherson and Dennis Schmitz) begun during her tenure(1983-93) as co-editor of "Poet News."